Sunday August 20th 1893 I staid at home all forenoon with Vene. Will was up town with Harry. Jim was over to the fair ground all the later part of the night and slept most of the day. Will Vene and I went over to Rohers in the afternoon and in the evening Harry went to church with us and Will talked with Jim. It has been a day pleasantly spent. 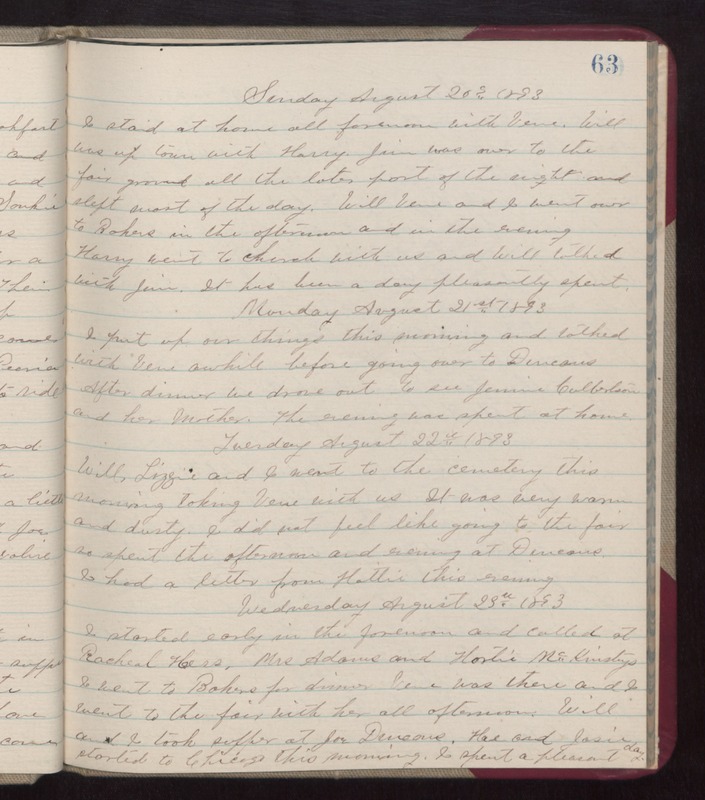 Monday August 21st 1893 I put up our things this morning and talked with Vene awhile before going over to Duncans. After dinner we drove out to see Jennie Culbertson and her Mother. The evening was spent at home. Tuesday August 22nd 1893 Will, Lizzie, and I went to the cemetery this morning taking Vene with us. It was very warm and dusty. I did not feel like going to the fair so spent the afternoon and evening at Duncans. I had a letter from Hattie this evening. Wednesday August 23rd 1893 I started early in the forenoon and called at Rachael Hess, Mrs Adams and Hortie McKinstrys. I went to Bakers for dinner. Vene was there and I went to the fair with her all afternoon. Will and I took supper at Joe Duncans. He and Josie started to Chicago this morning. I spent a pleasant.